GRG has been engaged in numerous nationally prominent matters at the request of courts and settling parties. We are staffed by more than 275 professionals, including attorneys, claims auditors, certified nurse reviewers, operations managers, IT professionals, content specialists, claims/class member service representatives, data analysts, accountants, and paralegals. In addition, GRG employs an additional 60 GRG Certified independent medical contractors including nurses and external MD panels. Every day, people suffer from permanent and debilitating injuries. 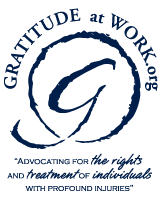 We launched the Gratitude at Work Foundation in 2007 to advocate for the rights of and promote the treatment of those individuals with profound injuries. The purpose of Gratitude at Work comes alive through both the financial and voluntary support that we provide to organizations throughout the country that support the courage of those that suffer daily from profound injuries. Visit the Gratitude at Work website for more information. If you are planning on filling out the form, please download the PDF. Do not view in a browser, please view in Adobe Reader.